We’d love your help. 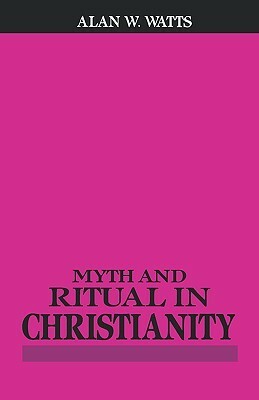 Let us know what’s wrong with this preview of Myth and Ritual In Christianity by Alan W. Watts. 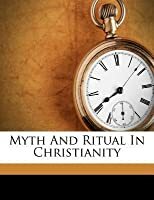 To ask other readers questions about Myth and Ritual In Christianity, please sign up. "Alan Wilson Watts (6 January 1915 – 16 November 1973) was a British-born philosopher, writer, and speaker, best known as an interpreter and populariser of Eastern philosophy for a Western audience." (Wikipedia) Also a former Episcopal priest, although in Myth and Ritual in Christianity, I often wondered if I had that wrong and he had instead been a Catholic priest! As I have been reading the book in the last few days, I have wondered how I was going to encapsulate what the book is. Then in the l "Alan Wilson Watts (6 January 1915 – 16 November 1973) was a British-born philosopher, writer, and speaker, best known as an interpreter and populariser of Eastern philosophy for a Western audience." (Wikipedia) Also a former Episcopal priest, although in Myth and Ritual in Christianity, I often wondered if I had that wrong and he had instead been a Catholic priest! "As soon as one gets used to looking at the Christian images from this outside in point of view, it becomes obvious that, in this way, they MAKE SENSE AS THEY NEVER DID BEFORE (emphasis mine). God returns to his temple, the heart, the centre of all things -- of man, of time, of space. Heaven is no longer in the place of Hell, the "outer darkness" of the most distant spaces and far-off times, but appears in the place of the most intense reality -- the now. Christ actually rises from the dead, and is revealed in this moment, and is no more locked up in the tomb of the remote past, in the dead letter of the written Gospels. The Mass is for once effectively sacrificed, for the Body of Christ, the church, is really willing to be broken, finding no further need to hold itself together with definitions and claims. The Faith becomes actual faith, which is self-surrender, as distinct from all anxious clinging to dogmatic rocks and doctrinal idols (!!). The authority of the Church becomes self evident, which is to say that the church actually realizes authority, so that there is no more necessity to prove it, to convince itself, by exaggerated proselytism and preposterous claims of spiritual monopoly. The dispensation of the Law, in which virtue is forced, actually gives way to the dispensation of Grace, in which virtue happily "happens", and is not grotesquely imitated. So understood, the marvelous symbols of Christianity might still -- one is tempted to say, might begin to -- have a message for Western man, that anxious and restless eccentric who has "no time" because he has reduced his present to an abstract dividing line between past and future, and who confuses his very self with a past which is no more and a future which is not yet. He, too, needs to be turned outside-in, to live in the real world which he thinks is abstract, instead of in the abstract world which he takes for reality. And for this he must know that the true place of Bethlehem, Calvary and Olivet is no more in history, and that Death, the Second Advent, and Heaven are not in a time to come. His "sin", his missing of the point, can only be forgiven if he repents -- turns away -- from his past as from the future which it implies, and returns again to his Creator, the present reality from which he "exists". Whereupon the life which had seemed momentary would be found momentous, and that present which had seemed to be no time at all would be found to be eternity." And so I appreciate this book because it has enabled me to return to Church as the Church is not telling the preposterously unbelievable, but is telling indeed the old, old story. First, and very importantly, "myth" does NOT mean "false" in the context of this book. Quite the contrary. It means a higher, the highest, truth. Watts' book is in the same lineage as Joseph Campbell's THE MASKS OF GOD (4 vols.). Having said that, onto brass tacks. Though I don't have time to write a full blown, decent review of this very intelligent, provocative work, I want to go on record (in kind of a public service announcement)about it by giving it a top rating and to recommend it to reader First, and very importantly, "myth" does NOT mean "false" in the context of this book. Quite the contrary. It means a higher, the highest, truth. Watts' book is in the same lineage as Joseph Campbell's THE MASKS OF GOD (4 vols.). Having said that, onto brass tacks. Though I don't have time to write a full blown, decent review of this very intelligent, provocative work, I want to go on record (in kind of a public service announcement)about it by giving it a top rating and to recommend it to readers who often feel uncomfortable with dogma and theology, whatever the flavor of their "faith" might be. I read it the first time over 25 years ago in a Literature graduate seminar on myth and mytho-poetic thought. It stunned me then, spun me around, and when I picked it up again last week it had the same startling, spiritually expanding effect on me. Watts' erudition is amazing and sound (I've studied this area/field myself for many years) and rather than trying to beat you on the head with theses, he instead alludes, connotes, and teases out of the narratives of the Bible and Catholic tradition (symbols, rituals etc) pivotal points, pivots really, through which we are able to perceive unity in diversity and sense the divine nature underlying all things. I have the highest regard for the usefulness of this book in breathing life back into what has become mostly dead and deadened nay-saying, finger-pointing, hateful and hating, "Christianity" today. I first read this book more than 6 years ago as a course at the St. Alban Liberal Catholic Seminary. It was absolutely revelatory then and has been so with each of my two subsequent readings. It would take far more space than this Review box to do a proper review (as another has pointed out), and I can only echo that "This is not your mother's catechism." And thank goodness for that! The deeply rooted aspects of the collective unconscious, the "dignity of myth" (Watts' term), and generally unack I first read this book more than 6 years ago as a course at the St. Alban Liberal Catholic Seminary. It was absolutely revelatory then and has been so with each of my two subsequent readings. It would take far more space than this Review box to do a proper review (as another has pointed out), and I can only echo that "This is not your mother's catechism." And thank goodness for that! The deeply rooted aspects of the collective unconscious, the "dignity of myth" (Watts' term), and generally unacknowledged history makes this a fascinating read for the open-minded believer and, even more so, for the atheist/agnostic. I do disagree with Watts on one conclusion only as it pertains to me; it is, however, probably generally true for most people. "[T]he Christ of Catholic dogma is a far more powerful conception than the rationalized Jesus of history". Perhaps I am not a Christ-ian but a Jesus-ian. I definitely prefer liturgical, high-church Christianity, but I am simply not in tune with my subconscious for Watts' approach to be fully incorporated into myself. This is the reason I also suggest "Moses and Monotheism" by Freud and "Jesus for the Non-religious" by Spong. This book is for the brave and curious, and they will not be disappointed. A thorough analysis of Christianity in the mid-1950's, Watts' comprehension of history and profound understanding of spirituality allow for an engaging story that dissects a religion which has more persuasion over Western thought than we would care to admit. On many levels, Christianity is a deep and powerful source of spirituality, promising eternal hope for those who are faithful but condemning those who choose not to believe in a religion formed 2000 years ago which claims to have intimate kno A thorough analysis of Christianity in the mid-1950's, Watts' comprehension of history and profound understanding of spirituality allow for an engaging story that dissects a religion which has more persuasion over Western thought than we would care to admit. On many levels, Christianity is a deep and powerful source of spirituality, promising eternal hope for those who are faithful but condemning those who choose not to believe in a religion formed 2000 years ago which claims to have intimate knowledge of the creation of the universe to an eternal suffering in Hell. Yet, through it all, Watts' amazing powers of objectivity, filtered through Eastern spiritualities such as Buddhism and Hinduism, is a deeply loving thing, often given to extolling Christian virtues while detailing the ceremonies which construct these "big feelings" inside Christian faithfuls. (though I'm sure conservative Christians would tell you otherwise) When the mystery of the faith, its foundations in a philosophy of thought which denies belief in anything but that which it has mandated as well the actions to enforce these principles on all, regardless of deviance from their authority, is explained on a minute, practical level, clarity settles on the reader. Ke knize jsem přistupoval skepticky. Říkal jsem si: “Alan Watts a křesťanství? Vždyť je expert na filosofie východu.” Kniha mě nakonec příjemně potěšila. Watts do hloubky rozebírá některé stavební kameny křesťanství a používá k tomu své zkušenosti s východními filosofiemi. Výsledek je zajímavý a inspirující. Inside is exactly what is says on the tin. Alongside detailed instructions on how to perform certain rituals is Watts' commentary on the mystical meanings. Also included where appropriate are the distinct similarities to be found in Eastern religions, bolstering on of the main themes of this work that through a shared unconscious Man consistently dreams up and creates the same myths, and to understand and benefit from these one must throw off theological interpretations that obfuscate the innerm Inside is exactly what is says on the tin. Alongside detailed instructions on how to perform certain rituals is Watts' commentary on the mystical meanings. Also included where appropriate are the distinct similarities to be found in Eastern religions, bolstering on of the main themes of this work that through a shared unconscious Man consistently dreams up and creates the same myths, and to understand and benefit from these one must throw off theological interpretations that obfuscate the innermost truths.